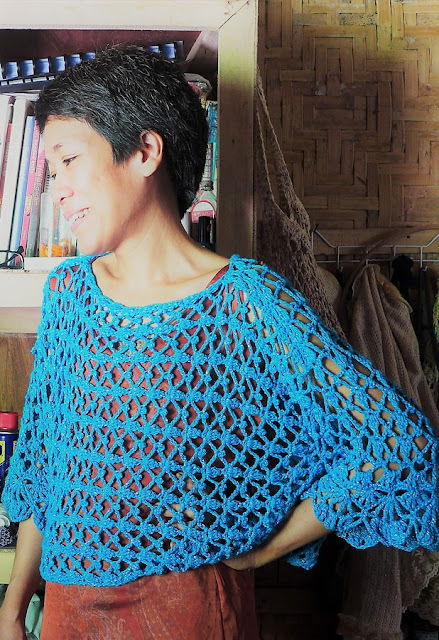 Design Notes: The top is crocheted in two pieces Front and Back. Each piece is worked from the bottom up. Shoulder and side seams are joined together using sc stitches worked on the wrong side. Model shown is in size S (Bust 32”), 21” long. Larger sizes may be made by starting with the appropriate length of foundation chain done in multiples of 8 +1. 2dc-CL (2 double crochet cluster): Leaving last loop of each stitch on hook, make 2 dc in indicated stitch, yo, pull yarn through all loops on hook. V-Stitch: In stitch indicated make (dc, ch 2, dc). Row 1: Ch 1, sc in second ch fr hook, sc in each ch across, ch 4 (count as dc, ch 1), turn. Row 2: Sk first two sc, dc in next sc, *ch 1, dc in next sc, rep fr * across. Ch 1, turn. Row 3: Sc in first sc, *ch 2, sk next dc, in next dc make (2dc-CL, ch 2, 2dc-CL), ch 2, sk next dc, sc in next dc, rep fr * across, ending with sc in last dc; ch 4 (count as dc, ch 1), turn. Row 4: Dc in first sc, *ch 2, sc in 2-ch sp bet 2dc-CLs, ch 2, V-stitch in next sc, rep fr * across, ending with (dc, ch 1, dc) in last sc; ch 4 (count as dc, ch 1), turn. Row 5: 2dc-CL in first dc, *ch 2, sc in next sc, ch 2, in 2-ch sp of V-stitch make (2dc-CL, ch 2, 2dc-CL), rep fr * across, ending with (2dc-CL, ch 1, dc) in last dc; ch 1, turn. Row 6: Sc in first dc, *ch 2, V-stitch in next sc, ch 2, sc in 2-ch sp bet 2dc-CLs, rep fr * across, ending with ch 2, sc in last dc; ch 3 (count as dc), turn. Row 7: Dc in first 2-ch sp, ch 1, *3 dc in next 2-ch sp, ch 1, dc in next 2-ch sp, dc in next sc, dc in next 2-ch sp, ch 1, rep fr * across, ending with ch 1, dc in last 2-ch sp, dc in last sc; ch 4 (count as dc, ch 1), turn. Row 8: Dc in first 1-ch sp, *ch 1, sk next dc, dc in next dc, ch 1, dc in next 1-ch sp, rep fr * across, ending with ch 1, dc in last dc; ch 1, turn. Row 9: Rep fr Row 3 onwards until desired length is reached, ending with either Row 4 or Row 6. Fasten off. Working on the Wrong Side, join side seams with sc leaving holes for arms. Join the shoulder seams using same method. Fasten off. Block to measurements. Hello! This is a beautiful top. I'm hoping mine will be as gorgeous as yours! Thank you for sharing your creativity.